The entrepreneurial group which controls Cantieri Navali Austin Parker has confirmed its interest in the Lobster Yacht market with its recent acquisition of the Abati Yachts brand. A business deal conducted by the group’s owners and management aimed at becoming a true market leader in this sector: in fact, today the 7 Austin Parker models are joined by 5 Abati Yachts models. The two most representative Italian brands in this industry, and among the first to design and build this type of vessel, are now united under a single sales strategy. The “classic” boat tradition is a counter-trend and yet, despite the economic crisis, it continues to capture interest and generate sales. Starting in September, the Austin Parker sales network, with a massive presence on the domestic market and an excellent position on European and international markets, will be offering a one-of-a-kind range of models from the two brands, composed of 12 boats of between 36 and 72 feet. 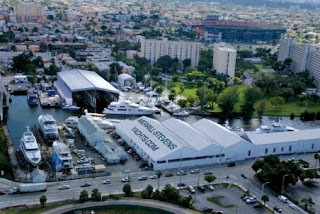 This new corporate structure will provide the shipyard sales offices with a diversified proposal to satisfy a clientele attracted by the modern, racy lines of the Austin Parker, the work of renowned designer Fulvio De Simoni, as well as a more classic clientele drawn to the features of the Abati yachts which more closely reflect the original concept of the “lobster boat”, a working boat designed for lobster fishing in the Maine State waters. The shipyard will be officially participating in the 52nd Genoa Boat Show with 4 Austin Parker models (2 of which are brand new, the AP 36’ Natante and the AP 64’ Fly) and 2 Abati Yachts models: the 46 and the 60. 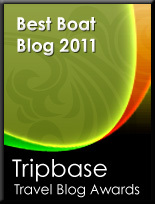 By year’s end the sales and marketing plans will be complete for the relaunch of the Abati Yachts brand in grand style. Two prestigious awards confirm the success of the Azimut Benetti Group at the Festival de la Plaisance in Cannes where 21 models were displayed, 4 of which were worldwide premieres. Azimut 55S has been crowned as queen of the gala night organized by Luxmedia Group winning the 2012 Most Innovative Yacht Award and The Best Layout and Interior design Award. After the wonderfully successful virtual showroom and the four previous Apps dedicated to the new 2012 models - Azimut 45, Azimut 60, and Azimut 62S Italia- and to the revolutionary Magellano 50, Azimut Yachts has launched a new App Store application dedicated to the shipyard, manufacturing technologies and the various yacht models. Design, materials, components, technology, highly skilled staff, everything Azimut Yachts is and does meets the very highest standard: quality. By downloading the new App, users will be stepping into the world of Azimut Yachts. The App features the models that are available in the Flybridge, S and Magellan collections, whose high-tech features are at the service of comfort, safety, and attention to detail along with the stylistic excellence that is the hallmark of Made in Italy products, and all of the services that are available to our yacht owners. 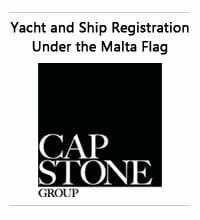 From previews of new yacht models, photos, videos and technical information sheets, and on to the always interesting Innovation and Technology highlights, which give customers an insight into all of the stages of production and new technology solutions, to ensure the utmost comfort and safety on the water. 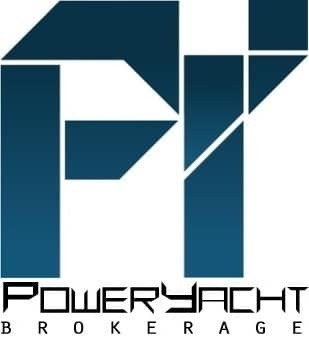 The app also has a feature that allows customers to search the sales and service network for contact information, as well as a corporate section that both retraces the history and the heritage of the largest integrated company in the nautical world and introduces the new challenges that lie ahead in terms of services and customer care. Azimut Yachts continually renews the relationships it has formed with its owners and fully utilizes the new opportunities that are available on the Web and on new digital platforms. At the Festival de la Plaisance in Cannes, 4 of the 10 new models to be launched in the new nautical season will be on show; boats filled to the gunwales with excellence and innovation, together with Italian quality and style. 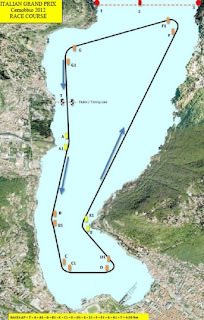 For the future, a new Integrated Nautical Centre is planned for Marina di Varazze. The economic stability and solidity of its equity, together with the will to explore new technologies through research and design models meeting the needs of different ways of sailing, have been the strong points enabling Azimut Benetti Group to overcome the difficult period in the nautical market with serenity, assuring the market a continuity in production and a solid relationship with its customers. Azimut Benetti is the largest private group of its kind in the world, in a global market that it is estimated has dropped 20%, with the segment of medium-sized boats most affected. It has maintained stable results during this period, with a consequent increase in market share, thanks to a production value of around Euro 600 million. It has reconfirmed 50% of its turnover on the American continent, with Brazil stable and the United States marking a further increase in turnover. Here, thanks to a strong and well-distributed presence, Azimut Yachts has registered impo years rtant sales performance. The Atlantis brand too, which first appeared on the US market only a few months ago, is showing a good response for the models offered. On the other side of the world, the Group continues to regard the emerging markets with interest, exploring new ones, such as Africa, and maintaining its internationality as ambassador of Italian-made quality. The company is one of the finest examples of this, able to control the entire production lines: from design of a boat to its production and to after-sales service. The Chinese nautical market remains unchanged, in part because of the slowing economy and uncertainty of the property market. Here, the Group, which has a leading position, has maintained the market share acquired and continues to follow developments to make the most of the country’s potential. The two locally-established companies have become operative; one in Shanghai, the other in Hong Kong, with a strengthening of the local structure with Italian and Chinese personnel, the aim being to provide support for sales and after-sales service. The Middle East remains stable, while Europe is beginning to recover. The industrial plan for the next three years foresees investments for a total of Euros 60 million, distributed both in research and development for new models and in structural investments in the various production sites. One of the Group’s characteristics is its ability to self-finance these investments, which also means being able to handle development in an autonomous manner, without being constrained to adopt industrial plans geared to short-term results. Over the next three years, 30 new models are planned, a reflection of the unceasing work of the Research and Development offices. In particular as regards the Business Line “Yachts”, Azimut Yachts and Atlantis brands are expanding their presence also in market sectors with greatest competition and high innovative content, such as small boats, eco-friendly and sporty ones. Each of these three areas is well-represented by three important new models for the forthcoming season, and on show in Cannes: the Atlantis 34, Magellano 43 and Azimut 55S. The Business Line “Megayachts”, which comprises the Benetti displacement range and the Azimut Grande series of planing yachts, is the division that has enjoyed the greatest sales success of the past nautical season, helped by a particularly lively market. Fifteen vessels have been delivered and there is a portfolio of orders for future delivery worth Euros 650 million. Benetti, which will celebrate 140 years of continuous production next year, will be presenting the Classic Supreme 132’ at Cannes, and has received an order for the construction of a 90-metre yacht by a client who has chosen the excellence of this brand for the third time. A Brazilian client has chosen the Azimut Grande 140, a prestigious three-deck planing vessel with an innovative hull assuring the comfort of a displacement yacht with the finest interiors. The craft offers a technological challenge as well as one of quality, design and style. This will be the largest Azimut, made with the expertise of Benetti, ever built. At the Festival de la Plaisance in Cannes, on top of the 22 models of the Group’s various brands on show, exceptionally there was also the Benetti “Diamonds Are Forever”, which with its 61 metres, will be the largest yacht ever presented at the Festival de la Plaisance. With a view to constant improvement and expansion in the services offered its clients, Azimut Benetti Group is planning the realisation of an Integrated nautical centre at Varazze. The aim is to bring together production, assistance, maintenance, refitting, berthing and leisure marine services on a single site. This new centre for the nautical market is planned for Varazze, where the company is negotiating to buy the areas of the former Baglietto boatyard immediately next to the Marina di Varazze leisure harbour and opposite a large and well-equipped dock within the marina built and operated by the Group. If the purchase goes ahead, it is planned that a new hangar will be built for the outfitting of crafts, together with large aprons for storing and refitting and, naturally, the creation of berths within an attractive, well-equipped and prestigious marina. The initial overall investment will be in the order of Euros 10 million. This acquisition is part of a long-term project the objective of which is the creation of further nautical centres in strategic points around the world. Azimut-Benetti is the leading and most prestigious builder of mega yachts in the world. Operating in 68 countries worldwide through a network of 138 sales offices, the Group includes the prestigious brands Azimut Yachts, Azimut Grande, Benetti, and Atlantis, with each one catering to a distinct segment of the yacht market. The Group also includes Yachtique, the service division exclusively dedicated to boat owners, also headed by brokerage and chartering specialists, Fraser Yachts. This year CRN, a brand of the Ferretti Group, participated again in the 2012 edition of Festival de la Plaisance (Cannes, 11-16th September), exhibiting one of its jewels – the 43 metre M/Y CRN Navetta 43 “Sofico”. The prestigious “Best Interior Award”, received for the interior design of the 43 metre megayacht CRN Navetta 43 “Lady Trudy”, confirms the high quality of the boats produced at the Ancona shipyard. This prize was awarded to CRN as part of World Yacht Trophy 2012, organized by the French editorial group LuxmediaGroup, at the end of the boat show. With its harmonious fusion of Made in Italy elegance and touches of the American colonial atmosphere, “Lady Trudy” is a composite displacement yacht with four decks that can comfortably host 10 passengers - in four Vip cabins and a master suite – and 9 crew members. The boat was designed by the CRN Technical Office, while the external profile and the internal layout was produced by the experts at Studio Zuccon International Project, who worked in synergy with the Centro Stile CRN. An elegant grey pearl hull with all the typical distinctive features of the CRN yachts: a large sun deck,a fitness area on the lower deck overlooking the sea and a terrace in the master suite, furnished as a “balcony” with a coffee table and armchairs which can be used at breakfast as well as during sailing. Among the other features of Lady Trudy, it is worth noting the elegantly furnished interiors which have given the ship its name: a plunge into the American atmosphere, with "Hampton style" romantic touches. Additionally, each one of the four guest cabins features a dominant colour linked to an American part of the North Atlantic coast: “Newport”, the starboard aft Vip cabin predominantly yellow; “Cape Cod” aft on the right where the predominant colour is green; “Mystic” at the bow on the left, with twin beds and a pull out bed, where red predominates and “Nantucket” aft on the left, where the main colour is blue. CRN Shipyard a Ferretti Group brand,specialized in the construction and sale of fully customized displacement megayachts made of steel and aluminium, ranging from 46 to 90 metres, and with a displacement line made of composite material (CRN Navetta 43) which is 43 metres long – has taken the opportunity at the traditional international boating event, the Monaco Yacht Show (Montecarlo, 19-22 September), to present its development plans and to define its current market situation. In 2013 CRN will have its 50th anniversary, a historical moment that testifies the well-established company, a brand of a niche sector on a market that has seen other important long-standing brands struggling. The shipyard will keep focusing on the Client and the Product - giving its maximum attention to the values of the brand: attention to the Owner, flexibility, tradition, reliability, design, craftsmanship and Made in Italy. With its constant research, CRN is developing various projects for its Owners. These are the seven megayachts branded CRN that are currently being manufactured in the shipyard of Ancona. In particular, the 80 metre, which in an advanced construction phase, will be the biggest megayacht ever manufactured by CRN, and will exceed the 72 metre "Azteca" and it will be the biggest yacht ever built in Italy. The Dislopen line and the new 60 to 80 m projects, are still in the designing phase and they are being designed by the prestigious firm Studio Nuvolari & Lenard. The excellent performance of the shipyard has been confirmed by the awards given to the 43 metre CRN Navetta 43 “Lady Trudy”, which received the “Best Interior Award” a few days ago at the World Yacht Trophy 2012 organized by the French editorial group LuxmediaGroup during the Cannes Boat Show that has just ended. The Ferretti Group, among the world leaders in designing, building and marketing motoryachts, with a unique portfolio of some of the most exclusive and prestigious brands in the nautical world, inaugurated yesterday the new nautical year as a protagonist, exhibiting, at the 35th edition of the Festival International de la Plaisance in Cannes, a substantial fleet consisting of 24 boats, 5 of which in world premiere: Ferretti 870, Ferretti 690, Pershing 82’, Riva 63’, Virtus and Mochi Craft Dolphin 64 Cruiser. 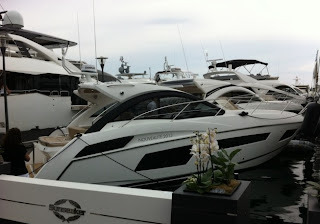 In addition, the traditional Ferretti Group Meeting was held once again this year, at the Cannes Boat Show. This is the tenth edition, during which, in front of a large audience of employees, dealers, clients, suppliers and the media, the Founder and Honorary Chairman, Norberto Ferretti, the new President, Tan Xuguang, and the new CEO, Ferruccio Rossi, gave the first report on the nautical year and introduced the renewed corporate structure formed after the capital inflow in the Ferretti Group of Weichai, The Royal Bank of Scotland and the Strategic Value Partners, as well as the Group’s objectives for the coming months. In fact, thanks to important synergies, the sharing of resources and the new strategic partnership with Weichai, the Ferretti Group is aiming at reducing the costs and strengthening the marketing channel and the after-sales services, as well as focusing on a strategy to further expand on international and emerging markets, specifically the Asia Pacific region, a strategic area for the future growth of nautical business, where sales have increased by 30%. In addition, having found patrimonial and financial standing, the Ferretti Group will continue to support its plans to develop in Latin America, as well as on the traditional European and United States markets, on which the Group has steadily maintained its position, and where the results achieved allow it to look ahead, confident that it will maintain its leadership, especially as regards the North American area. Throughout the nautical year, the Ferretti Group focused on the Asia Pacific Area, by participating in the main boat shows and nautical and luxury events in Thailand, China – in Hainan, Shanghai and Qingdao – in Singapore, in South Korea and Japan, as well as Australia and India. Moreover, the Ferretti Group keeps registering good performance in Brasil, where it has been present for over 20 years, taking pride in its leading position in the Country, and where the Ferrettigroup Brasil was official inaugurated over a year ago. On the other hand, as regards the remaining part of Latin America, the Group is carrying out a series of marketing activities with the objective of further developing the key markets such as Mexico, Venezuela, Panama, Colombia and the Dominican Republic, as well as establishing new relations with other key areas where interest in luxury yachts is strongly increasing, namely Perù, Uruguay and Argentina. Finally, as regards North America, the first market on an international scale for the nautical sector, the Ferretti Group has continued to further reinforce its presence and to expand its distributive network. In fact, to confirm this strategy, last May, the Group started moving the Bertram Yacht productive plants from the historical premises in Miami to the modern and strategic marina on Merritt Island, in Florida, USA. The new manufacturing plants will be in an area of almost 14,000 square metres and will be absolutely in the forefront with the objective of further innovating the Bertram boat range. The 2012 Issue of Spray Magazine is in the mail, just in time for fall boat show season! The 148-page magazine is packed with owner stories, company news, new model previews and other articles for GB owners and enthusiasts. Beautiful weather and the striking red hull of the Horizon EP69 drew crowds to the 2012 Newport International Boat Show, held September 13th - 16th in downtown Newport, Rhode Island. The Horizon EP69 was one of the most popular yachts during the show - eager visitors lined the dock each of the four days to view the EP69, the line sometimes reaching the entire length of the yacht. Guests praised the EP69 for her overall design, craftsmanship, interior volume and impressive performance and range, and Horizon expects for the interest seen at the show to result in further sales activity. The Horizon EP69 showcased at this year's Newport International Boat show as a part of her U.S. East Coast tour, which began in July. She will be on display at Trawler fest in Baltimore, Maryland September and will also exhibit at the 2012 Fort Lauderdale International Boat Show in October. The Hunt 44 Express Sedan motoryacht was recognized as the Best New Powerboat at mid-September’s 2012 Newport International Boat Show in the “Newport for New Products” judging. Her display was also accorded the Best In-Water Powerboat Display in the “Edson Star of the Show Awards.” No motoryacht has ever previously taken both awards. The Hunt 44 Express Sedan was designed and engineered by Hunt Yachts, working through their parent company, C. Raymond Hunt Associates – a unique partnership in boatbuilding (no other builder is owned by a design firm); her construction exploits the meticulous craftsmanship available at Global Yacht Builders in Taiwan. Only Hunt can combine such depth of deep-V knowledge, experience and proven performance so richly evident in this series of powerboats which includes 52 and 68 foot models previously introduced and themselves winners of multiple awards. “Newport For New Products” spotlights each Fall, at the start of a new marine year, the new boats and equipment that make the most significant contributions to the recreational boating experience. Judging is done by an independent panel of boating experts assembled by Bonnier Marine Group under the auspices of Cruising World, Sailing World and Yachting magazines. Awards are given based on innovation, value to consumers and aesthetics in several categories from which overall winners are chosen; the Hunt 44 was picked as Best Powerboat 30’ And Over, then best powerboat overall. Hunt Yachts has always attracted rave reviews for exterior styling, and the Hunt 44 was described as “stunning” as well as “powerful and classically handsome.” But it is the Hunt 44’s interior and ability to deliver all the functionality of her 52-foot sister that pushed this design ahead of all the other exhibits. The accommodations, with two ensuite staterooms, are finished in a “modern Bristol” fashion with high-gloss teak furniture and detailing contrasted with white vertical surfaces. This novel solution, according to judges, “pushed all the right buttons the interior is well executed airy and full of light.” Comments by show-goers well as the judges described the interior as “sparkling” and “spectacular.” The displayed Hunt 44 was hull #3 in this series, each built to individual owner’s personal requirements. Owners are given wide latitude in many aspects of detailing, including propulsion options ranging from diesel size to IPS and Zeus pods. Regardless of such customization, the judges noted on the Hunt 44 that “her overall look is solid, her hull design is solid, her interior is solid and her construction is solid.” Insiders revealed that she was, hands down, the best powerboat in the judging and in the show. Several years ago, Edson International established the ,” Star of the Show” awards program to recognize show exhibitors whose displays exude pride and professionalism while promoting the recreational boating experience and to encourage exhibitors to raise the standard of their displays. At this year’s Newport International Boat Show Hunt Yachts was judged by an independent panel as the Best In-Water Powerboat Display, assessed on the basis of cohesive branding throughout, eye-catching and inviting set-up, well-dressed, friendly and knowledgeable staff, collateral support and overall attraction. As innovators in boat building with the deep V hull, Hunt Yachts is justifiably proud to have flourished during the economic downtown with development of new product and to now have garnered both of these awards. The new Hunt 44 Express Sedan motoryacht made both possible. Early last summer in 2011, David Marlow purchased Merrill Stevens which has now become Marlow Merrill Stevens. The original shipyard was incorporated in 1885 making Marlow Merrill Stevens the oldest shipyard in operation today. The property is 12 acres and David is currently in the middle of a vast two year renovation. He plans on restoring this property and building fresh amenities catering to both family boaters and mega yachts as the facility can handle both. Community is important to David Marlow and he hopes that despite this lagging economy he can bring new jobs to the Miami River community. Somehow amongst the many projects that David Marlow is involved in, he somehow finds the time for new opportunity in the acquisition of Hunter Marine. The acquisition includes Mainship Trawlers which will be a great addition to Marlow's growing empire. David fully intends to bring to Hunter-Mainship the same advanced technology that he has developed with Marlow Yachts. He also plans to invest and develop these companies with the same cost efficiency and increased perceived value that he developed Marlow Yachts with. There has been some concerns that Marlow would move these operations overseas, but there are no plans of that happening. David intends to bring the technology from China that he has implemented to the US. Although, David does expect that there might be some small components such as hatches, ports, etc., built abroad for cost efficiency. Boats will be built in Alachua, Florida with the upmost concern for the environment & community in mind. David will be using the combined talents of all the companies involved to build impeccable yachts we can all be proud of. All of the core team members of Hunter remain on site in preparation for the upcoming "Life begins at Forty" promotional ventures to be unveiled in 2012-2013. The owners of the Mulder 54 Open Joliseas crossed the Channel to the UK to be present during the Summer Olympics in London. From its berth of the Thames, she offered a great view of the five Olympic rings suspended from Tower Bridge. The Mulder 54 Open returned to sea after the Olympics, returning to the Netherlands where her owners enjoyed excellent conditions during the rest of their holiday on the Dutch waters. Several weeks ago, Mulder put the finishing touches to the aluminium hull of the new Mulder 98 Flybridge. 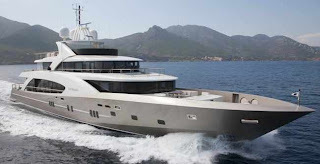 Built for a client in Russia, the yacht will be delivered in the summer of 2013. The hull is currently being equipped with a complete paint system. Meanwhile, the interior department of Mulder Shipyard is working on the interior of the yacht. Finishing activities will take place at our new facilities, due to be taken into use at the end of this year. What a show! Outer Reef Yachts first airing at a European boat show was a great success for the company, pulling in a great deal of serious interest, as well as arousing enormous curiosity amongst media and visitors. So much so that by Thursday all available accompanied viewings where booked for Friday and Saturday. Commenting on the show Trevor de Faoite Director of Sales for Europe said that Outer Reed is a fantastic product for the European market. Now that Outer Reef has exhibited at a European show, clients are able to peruse the surperlative engineering that goes into an Outer Reef and also see first hand the level of customisation available for interior décor and layout. This was noted by clients as remarkable for a long range 3000 miles autonomy, Cat A transatlantic explorer-style yacht, which also has good a cruising speed 11 knots and fuel economy advantages over its competitors. The 65th Edition of the Coppa d’Oro delle Dolomiti has just ended, a historical race for vintage cars, which starts from Cortina D’Ampezzo and moves along the enchanting scenery of the Dolomites. Continuing with their long-standing and established partnership with Parmigiani Fleurier, sponsor of this event, Pershing, brand of the Ferretti Group, among the leading international manufacturers of high performance open motor yachts, ranging from 15 to 35 metres, was one of the brands present at the event, in which some of the most prestigious luxury brands participated, from Porsche to Charles Heidsieck. Besides the vintage cars participating in the race, in the Parmigiani Lounge, which was set up in the lobby of Hotel Cristallo Spa & Golf, the guests and the VIPs who were present could admire the Pershing CBF chronograph, which was exclusively created by Parmigiani Fleurier and dedicated to the Confederação Brasileira de Futbol as the Federation's official watch supplier. Despite the gloomy climate that accompanied the race, a remarkable crowd participated in the event with more than thirty cars from all over the world, unable to resist the emotions that the event of revisiting the steps of this historical race can offer and which has seen illustrious participants such as Ernest Hemingway, to whom the race was dedicate this year on the 50th anniversary from his death. The guest of honour of this event, also the testimonial for Pershing together with the pilot Gian Maria Gabbiani, was the actress Giorgia Surina, who followed all the stages of the Coppa d’Oro on a vintage Porshe. For this event, the Pershing testimonials wore a selection of clothing from the Larusmiani Spring-Summer 2013 Collection. The elegance and the dynamism of Pershing, together with the exclusivity of Parmigiani Fleurier, were in perfect harmony with the prestige of an event like the Coppa d’Oro delle Dolomiti, expressing once again the uniqueness and luxury that have always distinguished them. Pershing, brand of the Ferretti Group, among the leading international manufacturers of high performance open motor yacht, ranging from 15 to 35 metres, ends the 35th edition of Festival de La Plaisance at Cannes in style by obtaining three important awards with Pershing 82’, the internationally premiered model at the French event. At the World Yacht Trophy, organized as usual by the French group Luxmedia Group - publisher of the boat magazine “Yachts”, present in France, Croatia, Russia, United Arab Emirates and Lebanon - the best boats, exhibited by the leading shipyards from all over the world, and judged by an international body of experts, were given awards. Pershing won the most prestigious awards of the “Sport Yacht over 24 mt” category: “Best design trophy”, “Best layout trophy” and “Best innovation trophy”. Ribbon Yachts is proud to announce a show collaborator with Icon Yachts. Ribbon will be offering tendering services to visit the Icon yachts afloat by bringing their newest float addition to transport visitors in style. Icon Yachts is the Dutch yacht builder in the top luxury segment. Tailor-made yachts with proven technology in 60 to 150 meters. Icon Yachts offers yachts with a short building time a competitive price. Icon Yachts also offers a wide range of refits possibilities and repair facilities. A momentous and history-making occasion will mark another major milestone for Riviera who will launch its 5000th boat at a special gala dinner celebration held later this year. Riviera’s state-of-the-art Coomera facility on Queensland’s Gold Coast will be transformed into a five-star entertainment precinct as Australia’s largest and most awarded luxury boat builder hosts a celebration like no other. Riviera’s director of brand and communications Stephen Milne is extending an invitation to all boating enthusiasts who would like to become part of Riviera’s maritime history to join in the fun. Riviera’s ‘5000 Reasons to Celebrate’ gala dinner will be held on November 2 to coincide with the Gold Coast International Marine Expo at Riviera’s state-of-the-art Coomera facility, 50 Waterway Drive, Coomera. Riviera, Australia’s largest and most awarded luxury boat builder has continued expand its American dealer network with the appointment of Sovereign Marine Group in Stuart, Florida. Sovereign Marine Group was founded in 2001 and has recently expanded to a full service marine centre serving Pompano Beach and expanding more than 500 kilometres north to Jacksonville, Florida. With offices in two locations, the Harborage Yacht Club and Monterey, Sovereign Marine Group offers yacht brokerage, storage for up to 40 vessels, certified marine mechanics, insurance, warranty, financing, canopy shop and electronics all under the one roof. Riviera Australia international sales director Chris McCafferty said Riviera was proud to be represented by one of Florida’s most esteemed and highly respected brokerage houses, Sovereign Marine Group. Sovereign Marine Group president Greg Terraglio said he was attracted to the Riviera brand because of the company’s longstanding reputation. On a recent trip to Australia, Mr Terraglio visited Riviera’s 14-hectare, state-of-the-art Coomera facility. While taking an extended factory tour, Mr Terraglio had an opportunity to view some of Riviera’s latest models. Sovereign Marine Group has two locations on Monterey Road and Flagler Avenue in Stuart, Florida. Sea Ray Boats was proud to host more than 400 customers at its inaugural Homecoming on Sept. 13 and 14 in its hometown of Knoxville, Tenn. The event, similar to the Homecoming events at schools and towns across the country, welcomed back boat owners for special activities celebrating the Sea Ray spirit and lifestyle. The event kicked off on Thursday evening with the world premiere of Sea Ray’s 2013 model-year boats at Volunteer Landing Park on the historic Tennessee River. Homecoming attendees witnessed a parade featuring more than 20 Sea Ray boats and yachts, along with the spotlight unveiling of two all-new models, the Sea Ray 370 Venture and Sea Ray 510 Sundancer. An exclusive Sea Ray Owners Club area with live music and refreshments was reserved at the restaurant, Calhoun’s on the River. Both the 370 Venture and 510 Sundancer mark new levels of design and engineering innovation from Sea Ray. The former is the first express cruiser created specifically around outboard engine power, and as such it offers exciting performance and endurance benefits, as well as an optimized interior with a full-beam master berth. The latter offers amazing interior light and livability with a main deck sunroom featuring a full-length sunroof and a lower deck atrium with oversized hull windows and open overhead that stretches all the way up to the windshield. On Friday, Sea Ray’s world headquarters welcomed Homecoming attendees for a full day of boat rides and demos; manufacturing facility tours; interaction with Sea Ray executives, designers, engineers and craftsmen; vendor displays; and a catered lunch. Another highlight was the Sea Ray vintage boat display, featuring classic models from the Company’s own collection as well as boats from Homecoming attendees. The boats brought by Sea Ray owners were judged, with the winners receiving gift cards redeemable for Sea Ray apparel, plus the opportunity to be featured in Sea Ray Living magazine. On Tuesday the 18th September 2012, twenty eight Sunseeker apprentices attended a passing out ceremony with the Group President of Sunseeker International, Robert Braithwaite. Since 1979, Sunseeker has been recruiting apprentices to work across the shipyards in Poole, Dorset. The apprentices take part in a four year programme that includes day release at college and on the job work placements across all areas of the business. As a result of hard work and learning across four years, each apprentice graduated with a level 3 in Boat Building and Marine Engineering, which is equivalent to A-Levels on the U.K Qualification and Credit Framework. The apprentices were also equipped with maths and soft skills, such as 'working with others' and 'improving their own learning'. Apprentices are a fundamental part to the continuation of Sunseeker International, which is proved by the fact Sunseeker International has continued to recruit up to 30 apprentices every year, despite the recent global economic downturn. The Apprentices are the catalyst for change and the solution for succession within the company. A small percentage of the passing out group will now proceed to enrol for the HNC Level 4 in Manufacturing Management, which Sunseeker will fully fund. By continually developing and investing in our workforce, we can retain our competitive advantage and ensure talented young people in the UK have the opportunity for employment, education and more importantly, an exciting and prosperous career with Sunseeker International. Sunseeker International Ltd's Supplier of the Year Awards 2012 were hosted by Andrew Macdonald - Director of Procurement at the PSP Southampton Boat Show on Tuesday 18th September on the Sunseeker stand. The awards were presented by Group President Robert Braithwaite CBE DL at a reception for the award winners. The awards are presented to suppliers and partners who have been recognised by the business for their outstanding performance in meeting the Sunseeker International Ltd's most demanding requirements. Afterwards the winners were able to visit the boats on display and see how their products or services contribute to the finished product. This year's award winners were: Phoenix Marine Solutions who received the Award for Technical Innovation, The Electric Center who received the Award for Cost Reduction, Cummins Onan who received the Award for On Time Delivery, Volvo Penta UK who received the Award for Production Support, Lewmar Ltd who received the Award for Value Improvement, Oceanair Marine Ltd who received the Award Outstanding Service, Max Osmund from MSA Manufacturing Ltd who received the Award Outstanding Individual Service, Allied Services Ltd who received the Award for Best Indirect Supplier, MonsterCam Ltd who received the Award for Best New Supplier, Navico UK Ltd who received the Award for Business Improvement. Mploy Staffing Solutions Ltd's Directors, Mark Nash and Evan Bebb and Sunseeker International Ltd's Director of Procurement, Andrew Macdonald have signed a further two year extension to the Master Vendor Agreement for Hourly Paid Agency workers at the PSP Southampton Boat Show on Thursday 20th September. The agreement covers the requirements of Sunseeker's sites based in New Milton, Portland and those facilities based in Poole by supplying agency workers from carpenters through to welders. Sunseeker's reason for extending the agreement was based on the continued high level of service we receive from the Mploy team, and their ability to exceed the levels set out in the Service Level Agreement. Princess present the new 82 Motor Yacht project, it's new entry level pocket super yacht offer. Extended window lines characterize the exterior of the 82 Motor Yacht project with a choice for a hard top covered flybridge with forward looking radar arch also being available. Exterior spaces about in the 82 from the large flybridge which can all be used for entairtianment to the forward part deck with its forward settee and sunpand. 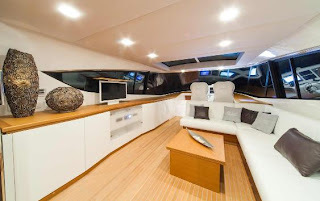 Inside a very light colored and conservative interior characterizes the layout with four double cabins below, and main deck seperating saloon dining with galley and helm areas. 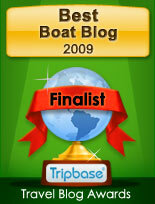 At aft is a twin berth crew cabin with lobby and direct engine room access. 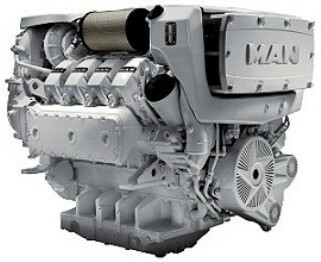 Power is Cat 1622 or 1723hp, and MTU 1624hp engines with top speeds of 34 being estimated with the larger choice. 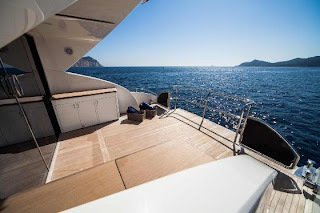 CNM acronym for Cantieri Navali Mediterraneo from Rome Italy is a young builder who has been on my radar ever since they launched the innovative 50 Continental model with its opening sides in 2009. Now four years after this debut CNM presents the 43 Continental its current entry level model, soon to be replaced by a smaller 33. The CNM 43 Continental as the bigger 50 shows its attention to large all deck use spaces with big sun loungers; two aft and one to fore being a huge part of its wow factor along with the side opening bulk heads. The forward sun pad also converts to a large U-shade table and as the picture above shows can be also covered in its special tent for nice al fresco dining. A central console which can also be covered by a hard top offers a three person settee helm station, and a back mezzanine bench completing the exterior layout. Down below is a twin cabin with well sized bathroom, and a small galley to starboard. Power options are three engine choices from Cummins 380 up MAN 800hp, with shafts or surface drives propulsion. It's been a hard year for most of the Italian builders especially for the smaller companies who cater for the more internal market. 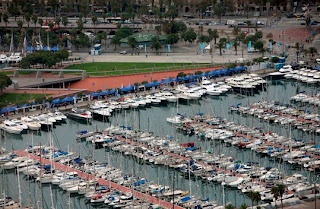 So this 52 edition of Genoa's boat show from the 6 to the 14 October comes in very troubled waters for an industry which apart the global slow down in economy of the last couple years, the high prices of fuel third World highest in Italy, come with a demagogic look twisted by politics that yacht equals tax evasive. Surely a sad aspect considering the size of the Italian boating industry largest in the World, and how many families actually take bread and water from it. From here I hope that this 52 edition of the Genoa boat show brings a turn around to this, and most important to leave boat builders to work and owners to enjoy the yacht. The novelties in this difficult 52 Genoa boat show are the following; Austin Parker 36 and 64 Fly, Azimut 43 Magellano HT and 76 Magellano, Azimut 54 and 84, AB Yachts 78, Vismara M/Y 56 Navetta, Magazzu MX-11 Coupe and MX-13 Coupe. 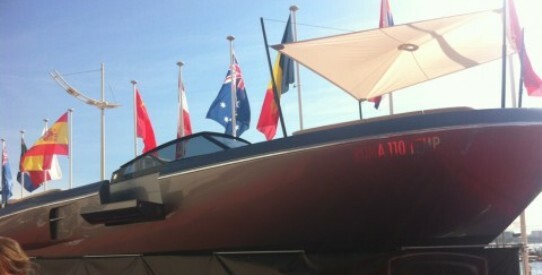 As is usual most novelties presented in other fall boat shows will be shown in Genoa. 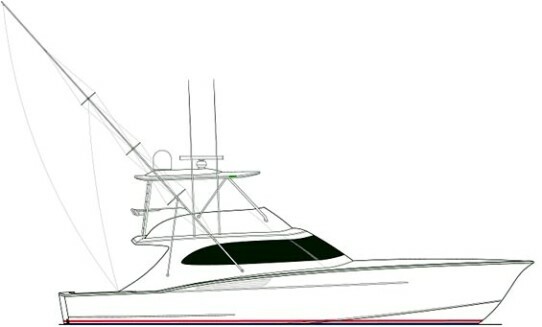 Ritchie Howell presents the project for a 54 Convertible, to be built as usual to this Carolinas US builder in the cold molding jig method and to a design of Mathews Yachts. An innovative project from a sportfisher point of view featuring a lower helm, and ZF pod drives propulsion. The bridge helm will also be located to forward, something unusual for a sportfish which for the most past feature a central console in the aft part of the flybridge in order to be in touch with fishing operations on the aft deck. Below accommodation will be a three cabins with two shower heads layout. Power will be from Cat 1200hp with ZF pods with top end speed being of 40 knots and cruise in the mid high thirties. Splash for this custom build is slated for the end of this year. It's been one of the most waited new models from Sunseeker in recent times, and finally it has arrived. This is the 40 Portofino hull one launching in mid Summer and making its World premier in Cannes, France. A return from the British Poole based boat builder to a forty feet entry level sport cruiser. It is very interesting how the British have in recent times attacked this 35 to forty feet sport cruiser bracket. Sunseeker has in previous years performed below expectations with its latest entry level models, 375 and 35 Portofino respectively so it will be interesting to see what the 40 will do. The new 40 Portofino follows a family feeling on the looks emulating the larger 48, and Predator 54 and 60 models, with the integrated hard top and huge side view glass surfaces being an important part of its design. Sunseeker with the 40 Portofino go a different route to most offers in this segment for the cockpit layout, going for a small aft sun pad which can convert to double in size, C-shaped settee, wet bar to port side, and two forward looking settees the one to starboard being for the helm. There is also the option for an extended up and down bathing platform which increases tender capacity and makes lifting and lowering easier. Down below design by renowned Ken Freivokh is a standard layout of two cabins, C-shaped saloon, galley and one guest head. The midships guest cabin has also option to be a three berth cabin, with bed three replacing the unit on the entrance. Standard engine power is twin Volvo 330hp give a 35 knots top speed. A faster 40 knots max is being estimated with the larger 400hp units. Since a long time I have been a big fan of Couach the French builder, and seeing them coming with some important projects is always good news. The new 2300 Fly, is one of seven Couach projects which should be launched in the coming years which start from a thirteen meter sport cruiser, up to a 45 meter super yacht. The 2300 Fly will be Couach entry level flybridge yacht, and will feature a four double cabins interior, plus two crew cabins. Interesting in the 2300 Fly is the very sports sleek line, with a very aggressive profile. Other details of the sports nature of this project are also to be found in the aft sun pad, and radar arch with hard top. Tender space will be located in the garage, with the flybridge fully dedicated for entertainment on standard specification. 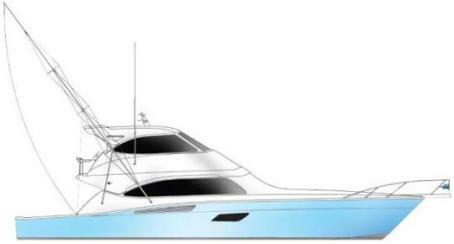 Power will be from twin MAN 1200hp with line shaft propulsion, giving a top speed of 32 knots and a cruise of 22. A new edition of the Barcelona International Boat Show is back this September, the benchmark event for professionals in the nautical sector in Spain and for sailing enthusiasts. It will be featuring all the latest innovations and sporting and recreational ideas for enjoying this massive nautical festival. The Boat Show covers five days, from 26 to 30 September. With this change, the show benefits from a warmer climate and more daylight hours as well as a more favourable position on the trade show calendar. 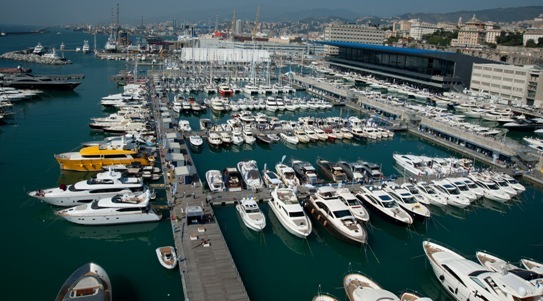 The whole floating and land-based exhibition of boats, products and services will be accommodated in a single venue. Visitors have the opportunity to do more test-drives of boats: the minimum length of boats in the floating exhibition area is being dropped this year to eight metres. Some World premiers will happen in Barcelona from the new Bavaria 29 Sport, Sasga 54 Minorchino, and new Rodman 31 Spirit Open. As with any Viking over sixty feet, it only a matter of short time that when the Open Bridge Convertible model is presented, Enclosed version is launched. Like the Open version, the 66 Enclsoed Brige Convertible has four staterooms and four private heads in its standard accommodation plan. The island galley, dinette, and salon also are similar, with the significant addition of an internal spiral staircase that leads to the enclosed bridge. The climate-controlled enclosed bridge is inviting and spacious with the main helm forward on centerline for good visibility. The raised ultra-leather dash handles a bank of navigation and communication electronics, and overhead, an accessory panel is easily read and reached. An adjustable Stidd helm seat provides plenty of comfort and support on long jaunts, and a large companion seat to starboard features drawer stowage and good visibility for crew and guests. Abaft the companion seat, a row of teak joinery houses bottle and general stowage. A flat screen television is mounted above the built-in refrigerator. A raised lounge with a teak cocktail table on the port side creates the atmosphere of a second salon for added privacy and convenience. A weatherproof lockable door leads to the aft deck and the second helm station, a pod design that has single lever controls, a stainless-steel wheel and stop start switches. Safety railing on the aft deck, as well as the exterior flying bridge access ladder is powder-coated aluminum. Power for the Viking 66 Enclosed Bridge Convertible starts from base MAN 1550hp, with other four options available up to twin MTU 2030hp. The MC 5 Monte Carlo project announced by Beneteau at the eve of the Cannes show surprised me, in an intriguing aspect. This was the return of the Monte Carlo signature used within the Beneteau sphere, something which I thought the brand wanted to separate three years ago when the first top end MCY line was launched and the sport cruiser range with this name then renamed to Flyer. Designed as the innovative and luxurious Monte Carlo Yachts by Nuvolari Lenard, the looks of the MC 5 surprises for its mix, of ultra modern with classic futures as the bow or its flash deck. The MC5 Monte Carlo being a flybridge motor yacht still does look very sports, as an enclosed hard top sport cruiser. Interior the MC 5 Monte Carlo designed by Andreani impresses for its abundant space thanks to the use of Volvo IPS pods; here offering a three double guest cabins lower deck, and a main deck with astern galley. Owners cabin is a full beam owners suite, VIP to fore, and a third cabin with bunk berths. A single berth crew cabin is available aft. Another area which surprises for spaces on layout seems to be the flybridge, offering a large C-shaped settee, and a settee plus sun pad to port side. Power is twin Volvo 370 or 435hp with IPS pods units with an estimated top speed of 30 knots coming from the larger choice. All you could want with that something on top, that is how the Belize 52 Daybridge presents itself in the official website. That unique wind in hair and sun on face boating experience came alive when the stunning new Belize 52 Daybridge made her world debut at the Sydney International Boat Show. Following on from the considerable success of the new 52 Sedan nine sold just after its launch, Belize impressed boating enthusiasts with the new Daybridge flybridge version recording three sales at the show. The Daybridge features a plush L-shaped lounge with hi-lo table, which can be converted to a second sun pad. The second helm station located on the Daybridge offers essential navigation aids, and if the weather becomes too hot, or cold, the Daybridge cover can be snapped on and the party can move to the protection of the lower station with saloon and aft deck. The bespoke Belize Motoryacht line is inspired by classic timeless US down East lobster boat style, incorporating traditional with Australian practicality matched with latest modern boating standards. This showed with tender garage, and three lower deck interior with a full beam midships owners cabin all simulating what was shown with the 52 Sedan at the start of the year. Power for the Belize 52 Daybridge is twin Cummins 600 horsepower delivering a top speed of around 30 knots, 25 cruise. A comfortable range 400 nautical miles is reached at 22 knots leaving a safety10 per cent reserve fuel margin. A trio of Italian teams will line up on Lake Como, Cernobbio for the Italian Grand Prix, the 159th Class 1 Grand Prix to be run since the multi-event format was re-introduced in 1992, and the 19th to be played out on Italian waters in 14 years, looking to end the run of wins in 2012 by the Middle East teams. LFFendi10, DAC Racing and Team D’Alessio-SCAM head the list of challengers who will be looking to unseat the current Championship leaders, Victory’s Arif Al Zafeen and Mohammed Al Marri. 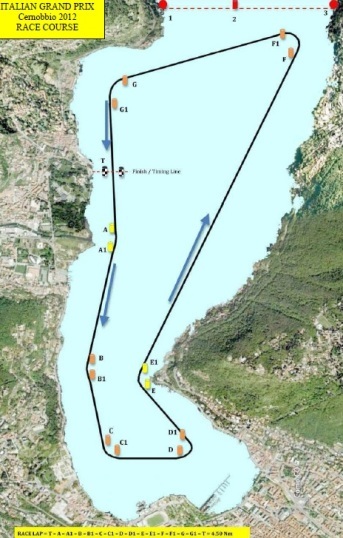 Eight boats will line up on the spectacular Lake Como 21-23 September, when Regione Lombardia and the City of Cernobbio host round 3 of the 2012 UIM Class 1 World Powerboat Championship. Class 1 first raced on Lake Como in October 1987 in a showpiece event organised by the late Bruno Abbate, which was won by former Italian tennis champion Adriano Panatta, and returned there last year for the first time in over two decades as an official round of the World Championship. Luca Formilli Fendi and Giovanni Carpitella look well placed to give the tens-of-thousands of spectators who are expected to turn out the home win they crave, after finishing second in race 1 of the Gabon Grand Prix in July and currently sit as the top placed Italian outfit lying in fourth spot in the Championship standings. Formilli Fendi and Carpitella look a resurgent force in the Championship since switching into a Victory hull SCAM engine package last time out and both are confident that they can challenge for further podium honours in Italy as they go in search of their first win together since teaming-up in 2010. Cappellini’s Mercury V8-powered Poliform clearly has great pace but the 10-time F1H2O World Champion, who switched to Class 1 in 2010, has struggled to find reliability this season. In Gabon, he and Montavoci, race 2 winner’s in Cernobbio in 2011 were hampered in both qualifying and in the race by recurring technical issues that ended their podium prospects and both will be eager to post their first race points this season. Team D’Alessio-SCAM field the same line-up that paired in Gabon and finished in fifth place, with the experienced Luca Nicolini, who finished fourth in both races in Cernobbio in 2011 on the team’s Championship debut, alongside rookie Gian Maria Gabbiani, making his Cernobbio debut and only his third start in Class 1. Looking to upstage his countrymen is Matteo Nicolini who lines up in Spirit of Qatar 95 alongside Qatari, Ali Al Neama. Nicolini - who lifted the European title in 2005 and the Edox Pole Position Championship last year - will be looking to add to his haul of four race wins, five pole positions and 27 podium finishes of those taking one win, one pole position and four podiums with Al Neama since they paired for the first time in 2011. Dubai’s Victory Team will arrive in Lake Como looking to put their name back on the winner’s roster and eradicate the bitter memory of last year’s two race-win and pole position disqualifications. Defending and four-time World Champion Arif Al Zafeen and double World Champion Mohammed Al Marri top the overall standings on 54 points after finishing third and winning in Qatar, winning again in Gabon and lead their UAE rivals, Team Abu Dhabi’s Rashed Al Tayer and Majed Al Mansoori, by 10 points. Since teaming-up for the season finale in Dubai in 2011, Al Zafeen and Al Marri have proved to be an intimidating partnership, winning four out of five races and going quickest in qualifying in three-out-of-three Edox Pole Position outings. Equally as impressive is the team’s record in Italy following their first win in Ischia in 1993 in their rookie season, winning 14 times from 20 races at 17 Grands Prix over 13 years, whereas Italian success post 1992 has been somewhat stifled, with all-Italian pairings winning four times on home waters; Antonio Gioffredi and Carlo Bonomi in Pescara in 1992, Luca Ferrari and Vincenzo Polli in 1995, Eduardo Polli and Lamberto Leoni in 1997 and Guido Cappellini and Giampaolo Montavoci in 2011 - as did Matteo Nicolini with Qatari Ali Al Neama both courtesy of last year’s Victory disqualifications. Britons, Norwegians and an American claimed the other three GPs during the same period. After opting to sit out the Gabon Grand Prix, Spirit of Qatar’s two-boat line up return to competitive duties and will be looking to claw back lost points and reignite their title challenge. A first win together in Class 1 for Sheikh Hassan and throttleman Steve Curtis, the defending European Champions, in the season-opener in Doha, Qatar in March put them joint top of the points table with Victory’s Al Zafeen and Al Marri. But the Dubai duo’s win in Gabon now gives them a 22 point advantage over their arch-rivals, with Team Abu Dhabi up into second place after Rashed Al Tayer and Majed Al Mansoori picked up their third podium of the year last time out. Teammates Ali Al Neama and Matteo Nicolini, the defending Edox Pole Position Champions and race 1 winners in Cernobbio last season, find themselves relegated to fifth with Zabo-Isiklar’s Turkish-Norwegian duo, Ugur Isik and Christian Zaborowski, who produced their best result of the year in Gabon, finishing in fourth place, and who will hope to benefit with more time on the water running their upgraded Mercury V8 engine package. Teams will face a revised course this year after officials responded to the call by some to modify the race circuit, extending the north end of the course in an effort to take the ‘sting’ out of the turn in front of Villa D’Este that saw both LFFendi10 and Spirit of Qatar 95 come to grief in 2011. LFFendi10 flipping over and Qatar spinning out but recovering to go on and finish on the podium. Official qualifying in the Edox Pole Position takes place on Friday 21 September at 15.00hrs, with race 1 of the Italian Grand Prix on Saturday at 14.30hrs and race 2 on Sunday at 14.30hrs. It's been a much long wait for the new second in size model of the Bruno Abbate Primatist family, the B62 Aerotop Pininfarina. Finally launched the B62 completes the today all in the water five model Pininfarina designed family which starts with the recently launched B41, and goes up to the G70 the start up for the collaboration with the known design firm and the Italian Como boat builder in 2005. As all the Aerotop Pininfarina I think the B62 brings a breath of fresh air in design terms to the industry versus the competition, from the look of the super structure to some unedited layouts which we have seen in other models of the range as the Special Edition option of the open aft deck shown for the first time on a custom orange colored G46, and since then also developed for another G53, and now shown on hull one of this latest Primatist. Inside the Bruno Abbate Primatist B62 is offered in a standard three cabins versions all with personal shower head; full beam owners stateroom, VIP suite to forward, and double guest cabin to starboard. Below is also a separate galley located to port side, although in four cabins version I imagine this to be replaced by same and kitchen moved on the main deck. Relaxing lounge is on the main deck a large L-shaped settee behind the very nice two seat helm, and entertainment area opposite. A crew cabin for one person is located to midships between the owners and engine room. Power for hull one is from twin Volvo 900hp with IPS1200 pods which should give top speeds in the region of 35 knots. In the D2868, MAN is offering the first eight-cylinder engine with common-rail technology for medium and heavy-duty operation. Thanks to the use of the latest common-rail technology, with its own internal measures the high-speed engine complies with the most important exhaust-gas standards worldwide. Moreover, this efficient diesel engine from MAN offers further improved fuel consumption with even lower noise emissions. Its full classification by the major societies expands the range of operating options that ship owners and captains have. The first product variant, the D2868 LE423 for light-duty operation, has already established itself on the market. In heavy-duty operation, the efficient MAN D2868 LE421 marine diesel engine for applications requiring up to 100 percent full load over unlimited periods of time outputs 600hp at 1800 rpm. With the D2868 LE421, MAN has expanded its range of new-generation high-speed diesel engines towards the lower end of the power output spectrum and is thus able to offer attractive solutions particularly for applications in this part of the range. Designed primarily for installation in tugs, push boats and heavy working vessels, this efficient eight-cylinder engine ensures reliable operation with minimal service costs and low fuel consumption The MAN D2868 LE421 600hp is available for delivery from the first quarter of 2013. The Sunreef 60 Power was made in response to the growing demand for compact yet highly impressive powerboats. This yacht has all the features of the popular 70 Power, except its eight meters and half beam makes it more convenient for crowded marinas, especially in the Mediterranean. 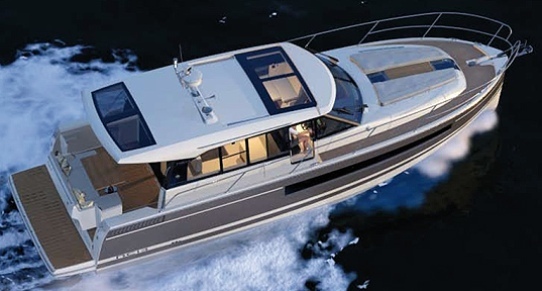 The first unit of the Sunreef 60 Power has been commissioned by a European owner, in July 2012. This is laid out in a semi-owner version with two double cabins in the forward section, two double cabins in the starboard hull, and one double, one bunk-bed cabin in the port hull. All cabins have private bathrooms and abundant storage. The interior of the main deck features the galley and a dining area, while a mezzanine floor located in the midships features the internal helm station and lounge, providing access to the forward guest cabins. The spacious sun deck, Sunreef’s speciality and trademark, comprises the external helm station, wet bar, dining area and a huge sun pad, ideal for outdoor lounging in the sun. There is also an option to include a Jacuzzi on the flybridge. The interior design of hull one is modern and minimalist, based on wenge and oak contrast, finished with cream and white upholstery and brushed stainless steel details. Interior is fully custom in finishing and and Sunreef offers two flybridge, six main deck, and six lower cabin area choices which can accommodate three of four guest rooms, one or two crew cabins, and galley up or down. Power for hull one featured largest twin MAN 800hp choice which gives 25 knots max, and 20 cruise speeds. It's been a long time coming for Couach new flagship the imposing and much waited 5000 Fly, a project announced in 2007. As is usual to Couach the new flagship follows on the innovation of this name from France which has always been in the DNA of this builder. Couah innovates in the building methods of its models using the most high technological materials, and the 5000 Fly continues this direction being fully built in Kevlar for both hull and superstructure, carbon reinforced, and also for using MTU 5300 or 5800hp engines. 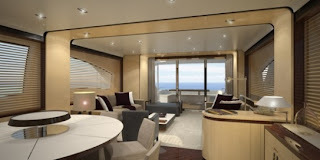 Inside the Couach 5000 Fly offers five hundred squared meters of living space, 75 of which dedicated for the main saloon and 52 for the owners stateroom in hull one. None the less the new Couach flagship is available in five or six guest suites layouts. Performance numbers are also equally impressive; 32 max speed with and 28 cruise with the big 5800hp MTU engines, and a comsumption of 1200 liters per hour at cruise. Slow down to 12 knots and you can consume only 200 liters per hour and a range of 4000 nautical miles. There is no two without a three or so says an Italian proverb, which Jeanneau follow to the letter with this new NC 14 project. Following by two years and a half the launch of the NC 11 the first of the range, which was followed by the smaller 9 model, this new Jeanneau will be the largest of this line designed by Garroni for all year round boating. Jeanneau has so far not passed much details, apart from the fact that we already know, that practical transforming features will be found even more in this new flagship model of the NC range. Power for the NC 14 which is something we know will come from twin Volvo 300hp diesel engines, with IPS400 pod drives.